Replacing carbon-free nuclear power with lignite coal and other fossil fuels made sense in Germany, natural gas/fracking also makes sense for pseudo-environmentalists in order to compensate fluctuations of wind/solar bird-choppers/landscape-destroyers. More stuff from Chernobyl Willie? There are at least three nuke plants here ready to close, which you can buy really cheap. Put your money where your mouth is, Willie, and you can have your own nuclear waste generators, . . plus the liability. Unfortunately the article is paywalled, so it's unclear what non-fossil fuel storage methods they looked at. H2? Batteries? Pumped hydro? What of increased exchange with neighboring countries? They conclude that this scenario would double the specific CO2 emissions, which would not make sense. Doubling next to nothing is still very little. 3. cost - the German experiment has demonstrated that renewables are proving to be outrageously expensive and problematic, no meaningful CO2 reduction, ecologically a disaster for mother nature. Nuclear power is the humankind's best carbon-free option to fight climate change. "Nuclear power is the humankind's best carbon-free option to fight climate change." Then go buy the Quad Cities Nuclear Powerplant. Or arrange to buy your power from Vogtle. I believe in alternative energy and power my house with PV solar. Why don't you man up and do your part? But it still makes no sense to do it. You're just trading nuclear power in for more climate change - which is worse? Remember that the same criteria applies not only in Sweden, but in principle anywhere. Wave energy is stupidly expensive. It's a lot of hoo-hah over nothing, and, it's also basically wind power so the output coincides with wind power and doesn't help with the variability. Then go buy the Quad Cities Nuclear Powerplant. That's a stupid argument. Why would you buy old ailing nuclear powerplants when you could build new ones? Btw. one of the reasons why the Quad Cities plant is running unprofitable is because the state policies cause a $11/MWh fee to the plant owners in the form of "congestion charges" on the grid thanks to insufficient transmission capacity. Or arrange to buy your power from Vogtle. What's the problem with that? Would if I could. In 2016, Exelon distributed charts showing it's nuclear plants earning revenue of $19,40/MW·h from Quad Cities to $27,80/MW·h from Dresden. Other values shown were: Braidwood $26.1, Byron $22.2, Le Salle $26.5 and Clinton $22.6. In 2016, Exelon also got a $5.60/MW·h additional revenue following agreements for high-demand periods delivery and in investor presentations, Exelon stated that about 90% of 2016 revenues are locked at more than $34/MW·h. Summing all together, it appears that almost all Exelon power plants, except Clinton, would break-even at $35/MW·h. So basically, the net revenue the Quad City plant is getting after all the extra fees and costs is 1.9 cents per kWh while it would need 3.5 cents to break even. Again, the problems ailing nuclear power are political, not technical or economical. $35/MWh is cheap. That sums up the drawbacks of wind and solar nicely. They are good sources of power to offset demand but until inexpensive, high-density electricity storage becomes available they can't replace base load power plants that can be throttled up or down at any time to meet demand. Among base load power plants, nuclear is by far the cleanest option. The old baseload meme again. Connect to the power grid to hide intermittency and/or to save batteries/energy storage, let fossil-fuel plants to stabilize the system. I wonder if there is a country or at least a megacity 100% wind/solar-powered? Excluding hydro, renewables is just a lure to take money from taxpayers to ruin natural landscapes. Ha ha! Read the conclusion of the link you provided. It's an exercise in self-contradiction. If you're using natural gas power plants to mitigate the load, you're not using renewables 100%. And "interconnecting power plants" thousands of miles apart is massively expensive. In other words, not economical. And FYI, greenonions, skepticalscience.com is devoted to the proposition that human CO2 emissions are the main cause of global warming in the last 50 years, a hypothesis that has not been proven and is the subject of much study and debate. They are hardly unbiased and their analysis of the ability of renewable energy sources to provide 100% (or near that) of baseload power is full of flawed assumptions. For one, they cite Denmark's use of wind power which is the highest per capita in the world. That's great, except most places in the world don't have winds that blow as reliably as Denmark. Same with photovoltaics. Every place on earth experiences darkness up to 12 hours a day (or more). To mitigate intermittent power production you need storage, like I pointed out. That storage (batteries) is extremely expensive. Until it becomes cheap, base load power will be produced by fossil fuels, hydro or nuclear. Nuclear is the cleanest. I feel like I'm repeating myself. Certain kinds of energy production make sense in places that have an environment favorable to their use. Denmark and Portugal have access to consistent winds that are economically close to large population centers. Most places don't. Denmark is one of the very few countries that could potentially rely 100% on renewable energy but it's also very expensive. They have the highest electricity rates in Europe, and high energy taxes to subsidize electricity production. Sorry, greenonions, I should amend my statement to "Denmark is one of the very few countries that could potentially rely 100% on renewable energy WITH CURRENT TECHNOLOGY". Who knows what the future will bring? I am optimistic that technological innovations will make it possible for most of the world to be powered by extremely efficient and/or renewable energy sources in a hundred years. The only renewable source that is currently competitive is wind turbines on land. Offshore wind is almost 3x as expensive. Thus Denmark's high electricity rates. And that's not considering the cost of having to use reliable base load power to take over when the wind isn't blowing. Portugal not 100% renewables, oops intermittency of hydropower. "In 2015, 50.4% of power produced in Portugal came from renewable sources, a drop in comparison to the previous year due to low productivity in the hydroelectric sector because of a dry year." I am so sick and tired of ignorant people - making it their occupation in life to spread lies, and hold up the progress of the human race. This concerns Sweden, with its current constraints and the recent political energy deal which likely will last for decades. The deal removed the idea of a retirement of fission with an energy subsidy of wind power that may force it anyway. Else it lets the current 10 plants modernize, even rebuild, as necessary. Sweden uses very little fossils for electricity, but a lot for industry and vehicles. So every little fossil use counts, especially since electric vehicles now seems technically and soon economically feasible. Meanwhile Sweden is a net exporter to the continent, and mountainous (water powered) Norway is planning to connect their two subnets through us, which means some "off site" storage (dynamic but also distributed). @aksdad: "skepticalscience.com is devoted to the proposition that human CO2 emissions are the main cause of global warming in the last 50 years, a hypothesis that has not been proven and is the subject of much study and debate." FWIW, AGW is tested back to the industrial revolution, so it is rather, what, 150 years now. Since you are a fringe in matters of the science, you lost the trust of the scientifically educated public you may want to reach. I meant _it_ (AGW) likely started 8.000 years ago. But that is a *real* science debate, with climate scientists slugging it out, paper result by paper result , conference by conference, community consensus building. Fun to follow (except that it is hard to know the consensus outside the type of review I linked to), if someone is interested in real climate science. I'd like to know if exists a country or a large city running 100% on wind/solar (24/7/365) i.e. not intermittently? There are just sensationalist headlines: "Portugal runs on 100% renewables", "Renewables peak at 95% of German electricity demand"
In truth, it is just intermittent energy sources causing instability on the grid that requires a lot of fossil fuels to stabilize it. "Portugal runs on 100% renewables for 4 days"
"95% of Germany's energy was provided by renewables last Sunday"
"Renewables peak at 95% of German electricity demand"
Again, the "renewables" term can either include or exclude hydropower to show more appealing results. "renewables (excluding large hydro) accounted for more than half of new power generation capacity for the first time last year.Including large hydro, renewables' share of all global electricity generation rose to more than 20%." Denmark does not use any hydro power - and are on target to get 100% of their power f rom renewables by 2050. But by now, more than 50% fossil fuels: oil coal and natural gas. So it can be inferred that there is no country or large city running 100% on wind/solar, because batteries/energy storage would be so immensely costly; in this way, fossil fuels are a blessing for renewables to obfuscate intermittency, forever, the world will not wean off fossil fuels. Nuclear power is the world's best carbon-free option to get rid of fossil fuels and fight climate change. 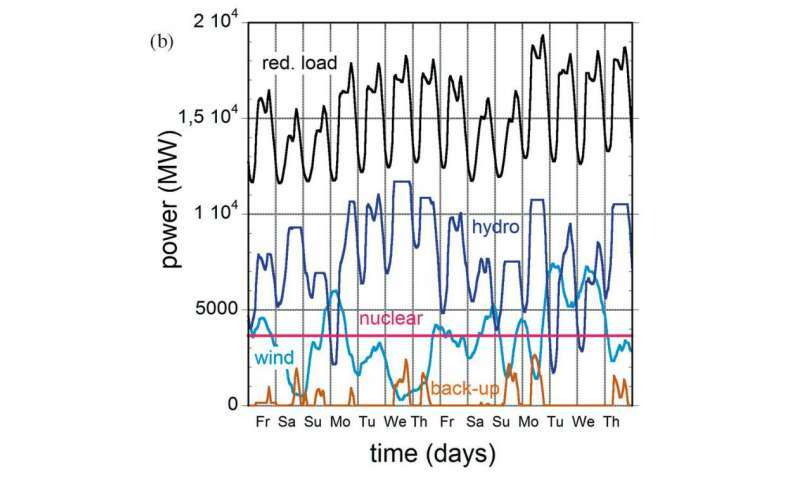 The point is: there are examples of systems that are using 100% renewables(which includes hydro) but there is no country or large city running 100% on wind/solar(no hydro); its Achilles' heel is energy-storage/batteries so the fossil fuels are to fill the gap left by carbon-free nuclear power, forever as hydro is not to grow so much, aside environmental impacts of dams.